Creating My Own Olympic Memories | Keep It Up, David! 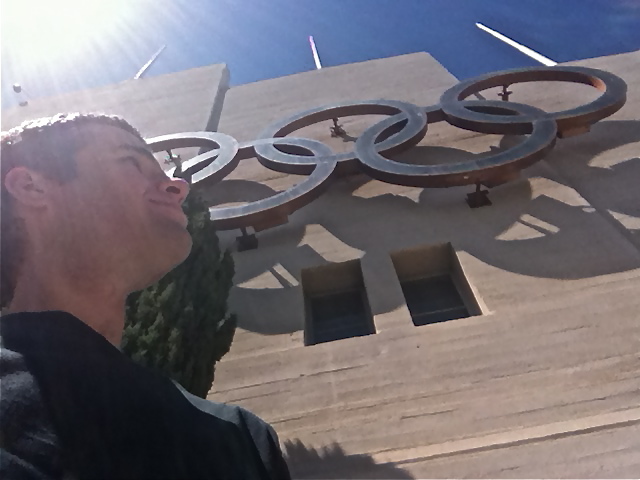 That picture of me with the Olympic rings was taken right here in Los Angeles. On Saturday, I headed down to swim laps at the John C. Argue Swim Stadium, a historic building in every since of the word. 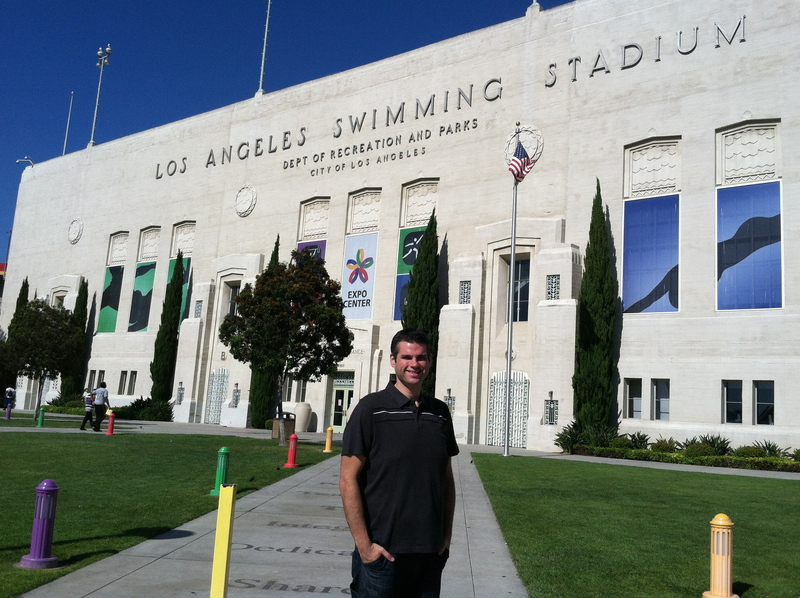 Originally called the Los Angeles Swimming Stadium, it was built for the 1932 Olympic Games. Olympic gold medalist and future movie star Buster Crabbe. Among the athletes that have competed in the Argue Swim Stadium are a couple that went on to become movie stars and household names. 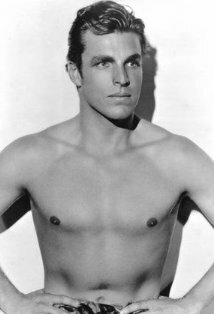 Buster Crabbe set an Olympic record during the 1932 Games in the 400-meter freestyle; he went on to star in over 100 movies, playing Flash Gordon and Tarzan. His friend, Johnny Weissmuller (himself a gold medal-winning swimmer from the 1928 Amsterdam Olympics that also later played Tarzan on the big screen) famously jumped a fence to cheer on Buster in his race. Another gold medalist, Eleanor Holm, winner of the 100-meter backstroke, also broke into Hollywood, and she too starred in a Tarzan movie. Champion swimmer and future movie musical star Esther Williams. A few years later, a teenaged Esther Williams performed a water ballet in the Argue Swim Stadium, before returning, a year later, to set a US record in the 100-meter breaststroke. She would go on to popularize an entire genre of film, the aqua-musical, in the ’40s and ’50s. 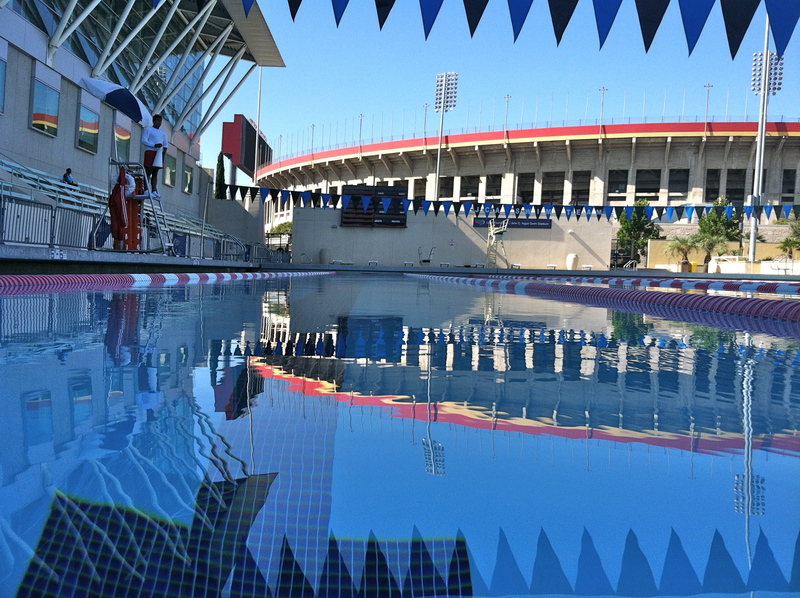 Throughout the years, the Argue Swim Stadium has served as a public pool and the home to the University of Southern California swim team, where, over a span of 12 years, a total of 65 world records were set – a figure unmatched by any other pool in the world. There were the bad times, too. The pool fell into disrepair in the ’70s and ’80s, and was closed permanently after the 1994 Northridge earthquake. The stadium underwent a major renovation and upgrade about a decade ago, and the results are magnificent – the historic facade went untouched, but everything behind it was overhauled. The pool is still open to the public, and just like the rest of the pools overseen by the LA Dept of Recreation and Parks, it only costs $2 to go for a swim ($2.50 if you don’t have a library card). On Saturday, I swam in the same pool that the best swimmers in the world competed in 80 years ago. Wow. The view from the edge of the pool. That’s the Los Angeles Memorial Coliseum, used for both the 1932 and 1984 Olympic Games, in the background. Before arriving at the pool, I watched on TV as Ryan Lochte and Michael Phelps raced in the preliminary heats of the 400 IM. So, after warming up, I did my own 400 IM – twice. Lochte ended up winning gold that night, with a time of 4:05.18 – and I’d say my time was just about the same, give or take about 4 additional minutes. Ha! In total, I swam 3,100 yards. I felt great. The pool is sleek, deep, and fast, and I had a lane to myself. I did some distance swimming, a few sprints, and eight 100s on an interval. At the end, I went to the deep end and did some treading drills that I remembered from my 2-year stint playing water polo in high school. That night, in addition to watching Lochte win his first London gold, I watched Sun Yung, from China, win gold in the 400-meter freestyle. His time, which was just seven one-hundredths of a second slower than the world record, was 3:40:14. For shits and giggles, I looked up Buster Crabbe’s gold-medal-winning (and Olympic-record-setting) time from the 1932 Games. It was 4:48.40 – over a minute slower than Yung’s time. Damn – the human race has gotten a helluva lot speedier slicing through the water! This workout will surely go down as one of my favorite workouts of all time. In addition to burning tons of calories and having a great time doing it, I was able, in a matter of hours, to tap into nearly a century in history – history that ties me to my community, to the industry I’ve built a career in, and to the history of the largest, most exciting sporting event on the planet – one that’s going on right now, in a pool much like this one, on the other side of the ocean. I left Argue Swim Stadium with goosebumps, because it’s connections like these that I draw inspiration from. 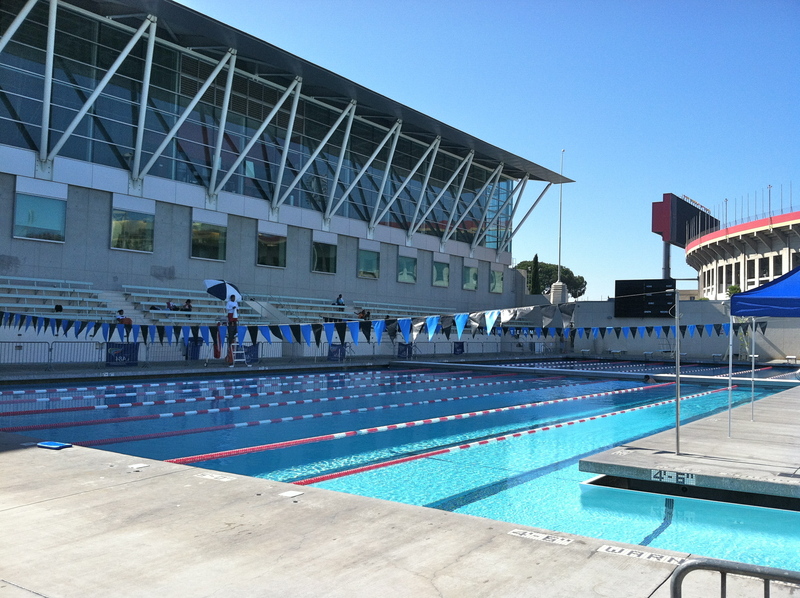 Thousands of swimmers have used this pool to push towards their dreams, to accomplish goals made possible by countless hours of determination and hard work, and to make a positive difference in their lives and in the lives of others. It’s my turn to add my name to that roster, because now I’m another small step further along my path to health and wellness, and that small step has given me a major shot of strength, confidence, and pride. It may not compare to winning gold at the Olympic Games, but I left that pool feeling like a champion. This entry was posted on Monday, July 30th, 2012 at 12:01 am and is filed under Uncategorized. You can follow any responses to this entry through the RSS 2.0 feed. You can leave a response, or trackback from your own site. I wish had public pools like this around here. Loved the history lesson. I clearly recall the 1984 Los Angeles Olympics as my sister and I were almost late to her own wedding due to traffic jams on the 405…It IS exhiliarating, to feel the former energies of those who have gone before us…goosebumps, indeed. You always wear a cosmic-karma Gold Medal in my history book, David. What an good excuse to be late, though! Hope things are good in your neck of the woods, Karen! That pool is sooooo cool!!! I want to swim in it with you!! !